1969 was a big year for going places. Hundreds of thousands of music fans went to the Woodstock festival in New York. Three sets of astronauts went to the Moon. And on February 15th, four “aquanauts” went deep. They began a visit to a habitat 50 feet below the surface of Great Lameshur Bay in the U.S. Virgin Islands. Tektite was a project of NASA, the Navy, and the Interior Department. NASA wanted to test how people would react to long missions in an isolated setting. The Navy wanted to test new equipment for operating in the world’s oceans. And Interior wanted to study the marine environment. The Tektite habitat looked like a couple of white coffee urns on a table. The “urns” contained living quarters, lab space, and a wetroom. All four aquanauts were marine scientists. They lived aboard Tektite for two months -- twice as long as any previous undersea expedition. They spent more time than expected just keeping the place running. But they also spent several hours a day in the water. They studied coral reefs, sediments, and much more about the environment. They also studied themselves, and evaluated their home; among other things, they told mission planners that the food left something to be desired. Tektite was refurbished and returned to the ocean the next year. 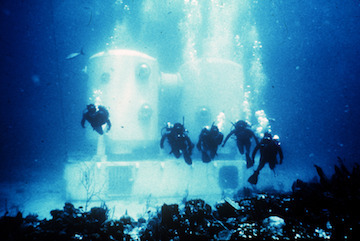 It hosted 53 aquanauts on 11 missions of up to three weeks each. The list included an all-female crew -- the first women to work aboard any underwater habitat -- one more record for a laboratory that first went deep 50 years ago.